The Cross of Salvation has been introduced when the apparitions of the Virgin Mary were still at the first Chapel in Modanza, in 1999. The Cross of Salvation has been given as a grace to the world by Jesus. It’s a different type of cross and is marked by the Visionary on people’s foreheads, by Jesus’ authority. The Cross represents our behavior at home with our family and with the Church. 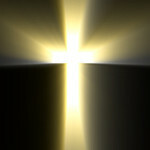 The better we live our lives in this relation, the brighter the Cross will shine on our foreheads. The poorer our lives is in this relation the fainter it will be. The Cross of Salvation cannot be faintly lit. Is this is the case you ought to work at this to make your life / behavior within your home and with the Church better – and when it’s bright, make sure to keep it bright. The Cross will sometimes be visible when we look at ourselves in the mirror and sometimes by other people. The Cross of Salvation is very important to have for the end of times. The Cross of Salvation is marked by the Visionary only. She marks the Cross of Salvation on anyone who truly desires this; when marking the Cross on pregnant women, their unborn children will automatically be marked. This Cross has an immense significance for humanity and for the world, since it is by the light of this Cross that Jesus will recognize you on the day of the calling. That is why our behavior needs to be correct, at home and with the Church. The introduction of this marking has begun as a result of the current situation of this world, in which evil is increasingly active. During the 3 days of darkness the Cross of Salvation is essential to have to be saved. If you are not in Aruba, and you cannot reach Koyari, please send us a request by filling in the form below and entering the names of your loved ones. Your requests are carefully provided to the Virgin Mary and to Jesus in Their apparitions and They will mark the Cross of Salvation spiritually wherever you are in this world. Enter your email address to subscribe to the most recent Messages, Activities and Words of Life.